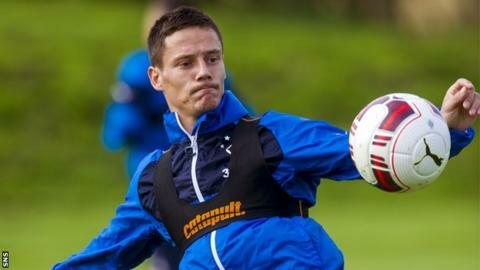 Ian Black suffered financial problems while with Hearts under previous owner Vladimir Romanov. Midfielder Ian Black is confident he will not suffer the same financial woes with Rangers as he did with Hearts. Black was forced to take up a part-time job as a painter and director as Hearts headed towards administration. Rangers chief executive Graham Wallace addressed his players on Friday to reassure them about the club's future. "It's not going to get to that stage. It's too big a club. The fans have helped out and stood by us through thick and thin," said Black. "They won't let us go into that situation. "These off-field matters can be distracting if it goes too far and gets to the situation when you don't get paid. That's when it certainly affects you. "But the board have told us, as it stands, it is going to be fine. "We can't affect that, so I don't want to pay any attention to things that will interfere with my performances." Black was speaking hours after it was announced that hedge fund Laxey Partners had strengthened its position as the largest shareholder in Rangers International Football Club PLC. It followed this month's sale of shares, when Rangers raised £3.13m intended to plug a gap in their budget but fell £900,000 short of their target amid criticism from some fans groups. Rangers manager Ally McCoist also addressed the club's staff at last week's meeting and insisted he and Wallace were delivering a positive message. "Graham met with everybody - not just the players," said McCoist, whose has led the club from Scotland's bottom tier to the Championship after their previous financial meltdown. "We had a staff meeting at Ibrox, which we have been known to have in the past, and it involved the staff from the stadium, the players and a lot of the staff from Murray Park. "I did read somewhere that it was a secret meeting. It was not a secret meeting, that's for sure. All the staff knew about it and were going to it. "It was fine. Graham addressed the staff, as did I for five or 10 minutes. That's all there was to it. "There was nothing at all said that would scare anybody. Quite the opposite. "We just wanted to keep everybody informed of what the plans and hopes are for the future and I would safely say it was very beneficial. "It wasn't so much that people wanted reassurance. They just wanted information and a chat about what direction the club was going. "It was nothing more than that and it was a good idea. It's something Graham is keen to do again in future."